With the Yankees winning the posting for Kei Igawa with what seems like an excessively high bid of $26 million, I guess that we should try to figure out what a reasonable expectation for him might be. Cliff Corcoran took an interesting look at Igawa on Bronx Banter already, and I'm going to take a shot as well. Instead of using the method I used for Daisuke Matsuzaka, I'm going to try a different method which I found by Jim Albright. Here are Igawa's career stats for Hanshin. 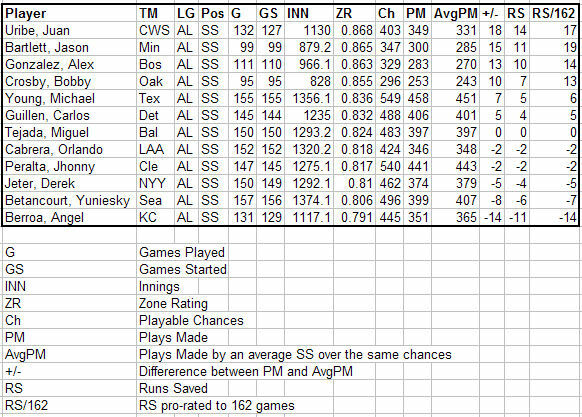 I took a weighted average of Igawa's last four seasons and then used Albright's factors to figure out the MLB translation. One thing to keep in mind is that Igawa played in a non-DH league, so I've added another adjustment, to account for the fact that he'll now be playing in a DH league. That line looks a lot better than I expected. I'd take that in a heartbeat. Of course, how a player puts up his numbers is often as important as the numbers themselves, particularly when they are coming from a new league with whole bunch of differences. So I dug around and found a scouting report on Igawa here. “He uses a four-seamer in the 88-91 mph range, with that 92+ capability on occasion, and an above-average change that I had in the 78-81 mph area. His breaking ball is a solid slider he’ll throw mostly to lefthanders, though he did use it to backdoor some right-handed bats. “It looked like he was playing with a different heater in some starts, perhaps a two-seamer or a sinker of some sorts, but his command of that pitch was very ordinary. His overall control is above average and he’ll probably need to be aware of the base on balls in America. Great. A high fastball pitcher who tops out in the low 90s. After reading more about Igawa and running the numbers, I'm not as down on this signing as I was yesterday. While I think the Yankees overpaid for the rights to just talk to someone who looks like he'll be putting up a 4.00 ERA, there are benefits to spending the money on the posting fee. It doesn't count against the luxury tax as many readers here have mentioned, it won't cost the team a draft pick if he's signed, and it potentially opens up even more Yankee visiblity in Japan. If the projection above is right, he'll be about as good as the Ted Lilly/Gil Meche types, with a lot less salary cap impact, even if the total outlay is the same. WFAN is reporting the Yankees had the high bid for LHP Kei Igawa. More on this as it becomes available. Igawa was 14-9 with a 2.97 ERA last season. Given what they have, he's no better than the No. 4 starter going into spring training. The winning bid was $25 million, which seems like a lot to spend on a No. 4 starter. I don't like this very much at all. $25 million plus a contract for a guy who projects as a #4 or #5 at best? Lame. I'm back from my vacation, and of course I missed a bunch of stuff, some good, some bad. Thanks to Fabian for filling in during my absence and doing a great job with the major league stuff and his prospect reports as well. I've been out of the loop, but here are my quick thoughts on some of the things that went down. On the surface, I like this move a lot. Gary Sheffield was a malcontent coming off a wrist injury and without a position on next year's team. Humberto Sanchez has tons of talent, with injuries the major concern. I'm less enthusiastic about the other two arms in the trade, as relief prospects rarely pan out. However, the Yankees got a prospect who will probably be one of their top five now, and didn't have to pay a penny towards Sheffield's $13 million deal. Seems like a good move to me. Another good deal. The Yankees would have owed Jaret Wright $4 million, so they basically traded Wright for a serviceable right-handed reliever in Chris Britton. Britton throws in the low 90s with a slider and changeup. The big issue with him seems to be his weight, but he gives the Yankees a little more depth in the bullpen at a time when people like Danys Baez are being paid $6 milion a year to very likely give a similar performance to someone like Britton at 1/10 the cost. I wanted Matsuzaka badly, but I see no way he's going to be worth $20-25 million a season, which could end up being the final tally once the posting fee is added to his contract. Wow. This is bad. Derek Jeter wasn't necessarily a slam dunk MVP candidate by any means, but Morneau is a worse selection than about 10 other people, including two on HIS OWN TEAM! This is inexplicable to me. I guess Jeter can console himself with Jessica Biel as a consolation prize. I like this signing too. Moose can probably be penciled in for 375 league average or better innings for the next two seasons. With the current market for pitching, this deal seems like a good one. The Yankees still need to fill the role of backup catcher. I was hoping they could snag Greg Zaun, although he is apparently returning to Toronto. The rest of the free agent catching group is pretty lackluster, although someone like Mike Lieberthal may be a good fit. He's been a starter for most of his career, although he's getting a bit older and banged up and may appreciate a shot at a ring as a backup if the money's right. They also still need to fill the starting 1B position, preferably with a solid right-handed bat. Shea Hillenbrand and Wes Helms don't really intrigue me, and while Craig Wilson has a pretty solid track record, his 100 disappointing Yankee AB likely mean he won't be back. I suppose a trade is a possibility, although I'd hate to see the Yankees tearing up the farm just as they're starting to build it back up to respectability. There's likely more moves to be made in the area of the starting pitching too. If I were the Yankees, I'd talk to Roger Clemens now and see if he'd be interested in one last go. None of the other options really interests me that much. Physical Ability: Zach McAllister is a BIG righty with untapped physical potential that the Yankees are hoping they can harvest. Listed at 6’5’’ and 230 pounds, McAllister was only touching the low 90s at draft time. In addition his go-to secondary pitches were a rough slider and chage-up combination. However, due to being the son of a cross-checker, McAllister had the “polished” tag attached to him and the Yankees picked him up. Since draft day, McAllister’s fastball velocity can now be pegged at low 90s due to mechanical adjustments made by the Yankees as well as by emphasizing the 4-seamer with him. He is also in the process of picking up a curveball to replace his slider. Finally, McAllister’s change-up has to this point been lauded as perhaps the best pitch in his arsenal and an easy plus pitch right now. What Happened in ’06: McAllister signed quickly and was sent to the GCL where he was most frequently seen as part of a starter tag-team duo with Dellin Betances. Drafted as a sinkerballer, McAllister was able to experience some early success despite a BB:K ratio of 9:8 through his first 19 professional innings. The reason for this is that over that same span of time he held a groundball to flyball ratio of 43:12, which is…absurdly good. The Yankees have a club policy of not altering a player’s game until 30 days into their career and it was about the conclusion of those first 19 innings that they decided to make the aforementioned modifications to McAllister’s approach and mechanics. The result was that over the final 16 innings of the season McAllister improved his BB:K ratio to 3:20 and his groundball to flyball ratio was still excellent at 23:10. What Lies Ahead: Zach should begin the year as a member of the Low A Charleston rotation and it seems that physically, the changes that needed to be made have been made, and so what is going to be critical is continuing to work on the mental aspects of the game. This means continuing to have confidence in the 4-seam fastball as well as his changeup and working in a curveball every now and then. McAllister is also going to have to do a better job of buckling down with runners on as he was guilty of giving up “the big hit” in ’06, though the sample size was small. Another small sample size concern is that McAllister struggled through some control problems against lefty batters. Physical Ability: Angel Reyes is, in essence, taking the mantle of hard-throwing undersized lefty from Abel Gomez. Hopefully for the Yankees, Reyes does more with his physical talent than Abel did. Similar to Abel, Angel throws a fastball that is in the low 90s, touching the mid 90s. Also similar to Abel, his secondary stuff is a mixed bag at the moment. Other than the fastball, he utilizes a change up and a curveball, but neither of the pitches is where they need to be at the moment and can be classified as show me pitches. What sets him apart from Gomez, and hopefully will make his transition to full-season baseball easier, is that Angel has displayed pretty good control to this point in his career and does not look like a threat to have a BB:SO ratio in the area of .75, as Abel has over the last 2 seasons. What Happened in ’06: Reyes began his 2006 campaign in the Gulf Coast League, but after demonstrating his self to be one of the most dominating pitchers in that league the Yankees moved him to Staten Island to help with their stretch run. In both leagues, Reyes displayed the ideal pitching prospect characteristics of groundballs, strikeouts, and avoiding the walk, though he did seem to battle his control when faced with left-handed batters. Being an undersized starting pitching prospect, stamina is always going to be an underlying concern, but Reyes was able to assuage some of that by improving his strikeout and groundball rates as the season went on. What Lies Ahead: Reyes should be ticketed for Low-A Charleston in 2007. There he will attempt to replicate the success he has had to this point of his career. As previously mentioned, developing his secondary pitches will be key as full-season hitters won’t be as likely to simply be overpowered by Reyes’ fastball. In addition, if he still struggles with the consistency of those secondary offerings, given his size, don’t be surprised to see a move to the bullpen. Physical Ability: Tim Battle is arguably the most physically talented position player in the Yankees system, and that is primarily why he appears on this list. A CF throughout his minor league career, Tim played some on the corners during the 2006 season in deference to superior overall prospects Austin Jackson and Brett Gardner. Defensively, Battle profiles well at all positions as he has excellent range and an accurate, strong throwing arm. Offensively, Battle has good raw power and projects as an above average offensive player as long as he makes contact, which is the big question at this point. Tim also possesses excellent raw speed and is often rated the fastest or second fastest player in the system, next to Brett Gardner. What Happened in ’06: I had very little faith in Battle’s ability to do well going forward and 2006 accurately represented that belief…to an extent. His performance in Tampa was poor as pitchers consistently fooled him and got him to strike out. When he did make contact it was poor contact and he hit the ball on the ground a lot. Upon demotion Battle regained his stroke. His walk rate went up, K rate went down and he hit the ball in the air more as well as hitting more line drives. This resulted in a .700 OPS, which is nothing too exciting, and less than his ’05 performance, but it was more promising as the secondary numbers point to it being a more sustainable performance. Tim Battle with a K rate around 25% is much more exciting that Tim Battle with a K rate in excess of 30%. Tim Battle with a 25% K-rate has a non-zero shot at being Mike Cameron. Here's how the ballots look. Justin Morneau is one of the worst choices for MVP ever. EVER. Not THE worst, but up there. -Chien Ming-Wang finished second in the AL Cy Young voting and Robinson Cano won the AL Silver Slugger for 2B a year after finishing 2nd in the AL RotY race. If these are the guys the farm can produce when it's terrible, the rest of baseball must be terrified of what will come now that the system is on the up and up. I kid, I kid...sort of. -The MVP is up next and I really, really, really hope Jeter wins, but with everyone and Johan Santana campaigning for the wrong Twin, I'm uneasy about the outcome. -Baseball America recently posted their Top 20 AFL prospects; Brett Gardner barely made the list at 19th. The Hawaiian Winter Baseball Top 15 was a different story as there were 3 Yankee pitchers in the Top 10. Joba Chamberlain was 1st, Jeff Marquez 4th, and Ian Kennedy 8th. Chamberlain being 1st was kind of expected at this point given the amount of outstanding reviews he's been getting, but I'm glad Marquez ranked as high as he did because he is a favorite of mine and I thought the ugly ERA would cause him to be overlooked. -After much internal strife, I've decided against ranking Jesus Montero because all I have on him are scouting reports. With the other prospects I am ranking/have ranked there's usually a decent amount of statistical data or I've seen them play or some combination of the two. -MiLB with their season review for the Yankees. -Best Buy is stupid. I lined up on Wednesday afternoon at 3:00 PM prepared to wait the 40 or so hours and get my PS3 as I knew they had 26 and I was second in line. Unfortunately, Best Buy decided to have mall security send me, and the 9 other people in line, home 3 hours later. They said they would not allow any lining up until 9PM Thursday night. We asked them why; they said they did not want the line to interfere with customers during the day Thursday. We alerted them to the fact that by creating this 9 PM start time they are only going to worsen the problem with a bottleneck. They did not listen. I arrived at Best Buy at 2PM on Thursday to scope out the situation only to find a bunch of people randomly standing around the grassy area across the parking lot. I returned to Best Buy at 6:30PM to find the group of people, now about 50 strong, standing by the yellow traffic division line 30 feet from Best Buy. By 6:50PM about 40 people, myself included, were standing in a reasonable facsimile of a line by the point where the line was supposed to start at 9PM. I was 14th. The rest of the mass had gone to the opposite entrance hoping to convince Best Buy officials theirs was the official start point. Around 8PM Best Buy workers come out to tell the crowd, which was now about 130 strong, that they did not know how they were going to handle this and that they would have a solution in 5-15 minutes. A Best Buy worker did not return until 9:03PM at which point he said the people who were in line, my group, would be the official leaders of the line. Predictably, everyone outside the line began to shove their way into the line. Mall security and state police officer (singular) were absolutely worthless in ceasing the carnage. After conferencing, the Best Buy workers decided that it would be best to have everyone (250 people at this point) write their name on a piece of paper, put it in a bowl and pick 26 names that can return Friday morning at 8 AM to pick up their PS3s. I did not get a PS3. 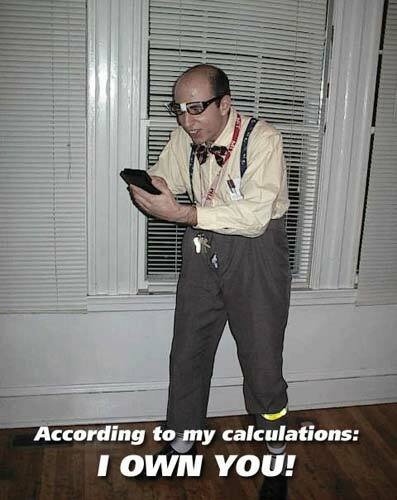 I called Best Buy this morning and they said their policy in regards to the Wii would be that customers could line up 24 hours in advance, rather than 12. I think I know where I will be at 8AM tomorrow morning. I'm going to be gone for the next 48 hours or so, so I don't have much time to comment on this, but it seems like a solid deal at face value. It appears all but certain that the Red Sox have won the Matsuzaka posting. On the one hand, I'm disappointed the Yanks weren't able to pick him up, on the other hand I think that's an excessive amount of money to be spending just to be able to negotiate with someone so overall I don't feel too terrible. The Red Sox rotation is now potentially an excellent one, but that's assuming Daisuke adapts to the AL smoothly and Josh Beckett rebounds. As I said previously, I now hope to see the Yankees pursue Barry Zito. Something around 4 years 50 million, if possible, would be fitting, but it's almost a certainty that Zito will be seeking/receiving more than that so next year's rotation at the moment is very much up in the air. UPDATE: No player on Earth is worth 51.1 million to negotiate with unless he's then going to sign for 10 million and 10 years. When Pavano is injured walking to the mound for his first start he can then be ably replaced by one of the members of Generation Right-Handed Pitchers™. Physical Ability: Jose Gil is a converted catcher without a standout tool. He has defensive potential, but isn’t maximizing it at the moment due to working out some of the mechanical kicks of being a catcher. On offense he has a pretty swing, but there is not much, if any, loft to it. His swing right now is more contact focused than anything, which somewhat limits his offensive potential. On both sides of the ball he is someone that can get by at the moment, but having seen him play, there seems to be a lot of potential there. What Happened in ’06: Gil started the year in Charleston with the rest of 2005’s promising GCL standouts, but was quickly demoted. On the one hand, the demotion seems out of hand because it was just 74 ABs into the year, but on the other hand it seems justified in that he was struggling to drive the ball. Gil then re-emerged as part of a tandem C duo with Francisco Cervelli (who would have made this list had I extended it a bit further). At Staten Island, Gil drove the ball a bit better, but still struggled with elevating it as 58.4% of his balls in play were on the ground. As I said, this seems to be a by-product of his swing, which while pretty just does not have much lift to it. Another by-product of his swing and approach, this one positive, is an impressive BB:K ratio of 17:16 at Staten Island. This was in line with his 19:18 in the 2005 GCL, making the 4:15 in his short Charleston stint seem completely out of whack. What Lies Ahead: I want to say that Gil’s low BABIP is a positive indicator for the future, but I know that it’s a “real” low BABIP based on his approach and speed. Right now, I’m banking on his approach, as far as the numbers and how it looks to me, translating into a more representative performance in 2007. It will be interesting to see where he is placed, as I’m not sure having him and Cervelli serve as tandem C again will help their development. There’s also some hope on my part that he will add more mass to his frame, as he has room to go, and may drive the ball better as a result of this. First reaction: good deal. More analysis/thought to come. 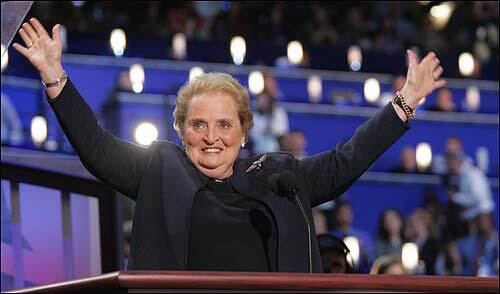 Now that I've had some time to digest the deal, I still think it is a good one for the Yankees. Sheff had little use on the team as there was not a spot for him in the OF and he didn't seem overly enthused to returning to 1B. At that point the Yankees could have let him go for draft picks or exercise his option and traded him. The question then becomes whether you think what they did gives them equivalent value to what their potential draft picks may have been. We don't know which slot the Yankees would have gotten or what the EXACT nature of this draft is, but we do know that the Yankees picked up one guy for AAA, one for AA, and one for A+. That eliminates some of the risk in draft picks, as these guys are some way along the developmental line. The key to the deal is, of course, Humberto Sanchez who has mid-rotation potential, but needs to keep his weight under control in addition to staying healthy. You could say he's somewhat of a poor man's Joba the Hutt. I like what the Yankees did in this deal as it provides them with depth for the starting rotation, in Sanchez who will start the year at AAA, as well as giving them more bullpen fodder for a guy who didn't really figure to be of much use to them in the coming year. The reason it's not a great deal is because these guys DO come with questions. That would be a ton of money. Way more than I thought. -Mark Melancon had elbow surgery, will be out for the season. As far as I'm concerned, this was almost expected. -The Yankees purchased the SI Yanks and are thinking about doing the same for Scranton. -Randy Levine responded to Sheff. Physical Ability: Eduardo Nunez is your prototypical toolsy shortstop, or so he was lauded prior to the opening of the 2006 season. He is seen as having above average, at least, tools across the board with power being the most average. His strongest tool is his throwing arm. What Happened in ’06: As I feared in my rankings last offseason, Nunez was overwhelmed starting the year in the Florida State League. His raw offensive performance was horrid, but upon hearing of his demotion to the South Atlantic League, I was optimistic about how his season would conclude. The reason for my optimism was that Nunez had been playing with a BABIP (Batting Average on Balls In Play) of .197, which is about .100 points about where it would normally be expected to lie. It seemed that Nunez’s luck was bound to rebound, which coupled with facing lesser competition made for a recipe for breakout. Unfortunately, this was not the case as Nunez posted a higher batting average, but his secondary skills further deteriorated as he hit for just about no power. In addition to performing terribly on offense, Nunez was a negative on the defense end. Despite having well regarded defensive tools, Eduardo has yet to turn this into defensive production. For every spectacular play he made, there was an inept one. He especially struggled on not throwing the ball at max effort on each play. What Lies Ahead: I expect Nunez to open the season starting at SS for Charleston. Though he is still very young, his 2006 season was very damning for him in my eyes. While statistics below the full season A ball level should always be regarded with a ton of skepticism, it is worth noting that prior to 2005, Nunez had not hit at any level. In fact, the only reason he was in Staten Island to begin that season was because injuries had forced the Yankees hand in regards to his development. Furthermore, it’s extremely difficult to find ANY silver lining in Nunez’ struggles in 2006. He did not control the strike zone at either level and this offensive approach resulted in him struggling to hit the ball in play to the opposite field with any strength. In addition, Nunez was adept at popping the ball up. Not a big fan of Brett Gardner, but otherwise the list seems to be as expected. The Yankees and Mets are expected to submit highly competitive bids on Japanese superstar pitcher Daisuke Matsuzaka by 5 p.m. today, and this battle of international intrigue could make the difference in which New York team gets to the World Series next year. Throw in the deep pockets of the Red Sox, Cubs and Rangers, and the possible dark-horse bids of the Padres, Orioles or someone else, and you have an adventure worthy of a James Bond film. Call Matsuzaka "The Man with the Golden Arm." "He's definitely a top-of-the-rotation starter," one major-league official said yesterday. "He's one of those guys that never really throws the same pitch twice in the same sequence. "He's a guy who should have tremendous success in the States. He's probably like [Greg] Maddux early in his prime - probably with a little more fastball." I read somewhere that one leaked bid was for $21 million, although I can't find it right now. I'm going to be on vacation for the next 2.5 weeks, so no new posts from me. Fabian will be trying to put up some stuff on his prospect analysis and any other newsworthy items. In the meantime, you can also check out the following blogs for your Yankees fix. I hope to come back to the news that the Yankees have won the bidding for Matusaka, and that Gary Sheffield has been traded for lots of good stuff. Gary Sheffield reported to spring training in February eager for the Yankees to exercise his $13 million option for 2007. General Manager Brian Cashman told Sheffield he expected to do so, and yesterday, he did. The circumstances are different now, because the Yankees have Bobby Abreu to play right field. They have not ruled out bringing Sheffield back as a first baseman, but their preference is still to trade him. For all his bluster in recent weeks, Sheffield will report to whatever team ends up with him and play hard, his agent said. The rumor mill has been pretty vague so far regarding a Sheffield trade, with the only known trade offer made by Baltimore (Kris Benson and a reliever). Thankfully that was turned down. Also in this article is the story that Mike Mussina and the Yankees are close to agreeing on a two year, $21-23 million contract. Sounds like a good idea to me. The owner of Top Prospect Alert sent me an email to let me know that they've posted the Yankees' top 10 list. Not much surprise to see Phil Hughes at #1. The rest of the list is pretty interesting, as three 2006 draftees are in the top 10, which could either mean that the Yankees had a good draft, or had a bad farm system. 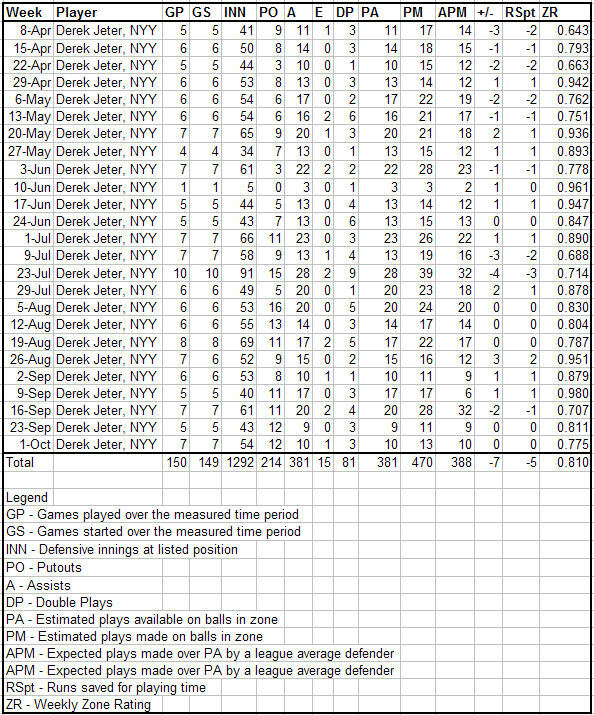 Since J asked about Derek Jeter's defensive trend in 2006, here are the numbers by week. 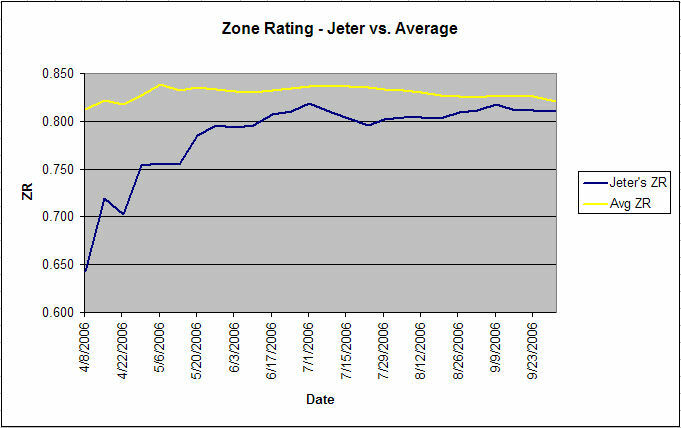 To illustrate the improvement Jeter made over the season, here is a graph comparing Jeter's ZR with the league average at the end of each week. Jeter ended the season playing fairly well defensively. He's close enough to average over the last few seasons by ZR that I feel comfortable he's not some horrible defensive shortstop who costs the team 2-3 wins a season with his glove. He's just not a Gold Glover. In other news, the Yankees are reviewing their options (get it?) with Mike Mussina and Jaret Wright. Wright was serviceable, but with a $4 million buyout, the question becomes if he's worth the additional $3 million it would cost to have him on the team in 2007. I don't think so, but I wonder if Wright plus $5.5 million could fetch a prospect from a team in the NL. Probably not. Jim Kaat is a candidate for the Frick Award, which would get him into the Hall of Fame. He's wasn't quite good enough to get in as a player, which Kaat himself will freely acknowledge, but I hope he gets this. NEW YORK -- Derek Jeter added another piece of hardware to his trophy case on Thursday, capturing his third consecutive Rawlings Gold Glove Award. I don't have much to say about this, except to present the following chart sans commentary. I've done a little writing for Sports Nippon in Japan. My editor from that paper told me tonight that the big news in Japan is that Seattle does not plan to make a bid for Daisuke Matsuzaka. The Mariners are controlled by the same Japanese company that owns Nintendo. Despite their resources, they apparently don't want to spend the $70 or $80 million it could ultimately take to get the right-hander. It would be almost shocking at this point if the Yankees don't end up with him. The Mets have the resources but have been burned many times by Japanese players. The Red Sox could get in the mix, too. But I suspect the Yankees will blow everybody out of the water. They've drawn eight million fans the last two seasons. That's a lot of $8 beer. Thanks to Cutter for the heads-up. Interesting, although I still think another team could win the posting process depending on their desperation. According to this article, Matsuzaka will be posted today, and teams will have until next Wednesday at midnight to submit their sealed bids. They also mention the Yankees having some interest in Jason Schmidt and Jeff Suppan.